We would like to warmly invite you to our 2018-2019 Spring Term Parents-Teacher-Student conferences. These conferences will give you the opportunity to discuss your child’s progress with their teachers. 11:40 AM: All students will be dismissed from school. We would like to warmly invite you to our 2018-2019 Fall Parents-Teacher-Student conferences. These conferences will give you the opportunity to discuss your child’s progress with their teachers. 11:45 AM: All students will be dismissed from school. We are honored that your student confirmed acceptance to UAMA and we look forward to having you join us as members of the UAMA community! Please make sure you read all the way through this email as there are important opportunities and links at the bottom. We invite you to join us on Thursday, May 31st from 5:30pm to 7:30pm for the Class of 2022 Orientation and Welcome Event at UAMA, hosted by Founding Principal, Paul Thompson. Students will have the opportunity to take part in a unique activity that will expose them to some of the core educational beliefs of the school, learn about the school’s advanced Early College programs, and meet some of the peer mentors who will support their transition into High School. PLEASE REPLY TO THIS EMAIL TO LET US KNOW IF YOU ARE COMING. This summer we are very excited to be offering a Summer Bridge Language & Thinking program at UAMA. The program runs from 9:00 a.m. to 12:00 p.m. from Monday through Thursday from July 16 to August 15, 2017. Breakfast and lunch will be provided (Students are not allowed to leave school for lunch). The Summer Program is designed to provide you with an opportunity to improve your academic skills in Literacy, Writing, Critical Thinking, and to earn high school credit before you begin in the fall of 2018. Research shows that surpassing 11 credits by the end of 9th grade is an important target to meet for high school success and on-time graduation, as well as to be better prepared for college. This program will also help you take advantage of our Early College model which you can start as early as 10th grade, allowing you to register for classes that confer both High School and College credit. The goal of this program is not only to develop your academic skills but also to have fun learning, build relationships, and help you successfully transition into high school. Students will have the opportunity to earn Elective Credit over the summer as they sharpen their reading, writing, and argumentation skills in English and practice and prepare for the Algebra Regents and ELA Exams on August 16th. At UAMA all students are expected to take the ELA and Math Regents exams starting in the first year and to keep taking the exam until they reach New York State College Readiness Standards. Space is limited and students who attend the May 31st Welcome and Orientation will be given seating priority. All incoming 9th graders are eligible to take both the ELA & Algebra 1 August Regents on Thursday 8/16/18 @ 8:30 am. Recognize that extremely brief garments such as tube tops, net tops, halter tops, plunging necklines (front and/or back), clothing that exposes mid-section of the body, miniskirts, and see-through garments are NOT appropriate for school. Ensure that all underwear is completely covered by outer garments. Not include items that are vulgar, obscene, and libelous, or denigrate others on account of race, religion, national origin, gender, sexual orientation, or disability. Not promote or endorse the use of alcohol, tobacco, or illegal drugs, and/or encourage other illegal or violent activities. Students who violate the dress code shall be required to modify their appearance by covering or removing the offending item, or, if necessary or practical, replacing it with an acceptable item. Any student who refuses to cooperate may be required to have a parent/guardian pick them up or possible suspension. Please note that PTA will be cancelled this evening due to inclement weather. We will reconvene next month. We have updated our bell schedule for the 2018 Spring Term. The safety and well-being of our students and staff members remain our highest priority. Toward that end, we are notifying you that this morning, we were informed of a potential threat to our school on social media. NYPD was immediately contacted and is actively investigating the report. In the interim, we have been assured that there is no immediate threat to students, faculty or staff at our school. We therefore are proceeding with a regular day of instruction. As part of our safety efforts, we have increased supports including additional school safety agents and NYPD presence on campus. Thank you for your cooperation as we work together to ensure that our school continues to provide a safe, supportive learning environment for all of our students. It is important that we remain vigilant, and if we see something, say something. If you have any questions, please do not hesitate to contact the school at (718) 858-0249. 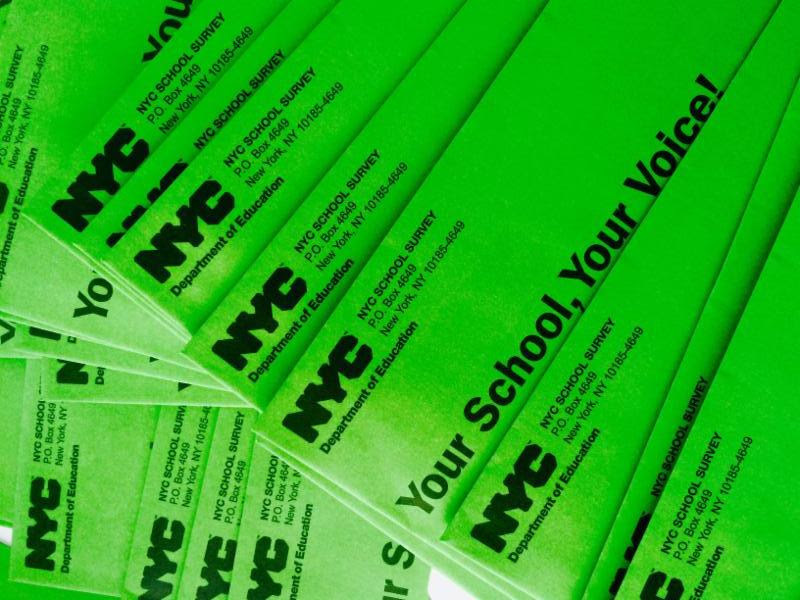 Every year, all parents, teachers, and students in grades 6-12 take the NYC School Survey. The survey helps school leaders understand what key members of the school community say about the learning environment at each school. The 2017-2018 version of the NYC School Survey is aligned to the DOE’s Framework for Great Schools and collects important information about a school’s ability to improve student achievement and can support a dialogue among all members of the school community about how to make the school a better place to learn. Parent Surveys are due by March 23, 2018. Therefore, during Parent Teacher Conference on March 8th & 9th 2018, we will have a room set up for you to complete your survey. We would like to warmly invite you to our 2017-2018 Spring Parents-Teacher-Student conferences. These conferences will give you the opportunity to discuss your child’s progress with their teachers.